Arcanys is a Swiss company that specializes in developing and launching ideas, primarily for Western startups and SMEs. Founded by Swiss entrepreneurs, we are passionate about innovation and working with new technologies. We like change and are constantly looking to evolve our core services of tech integration, custom software & mobile application development, and startup acceleration. The vast majority of our clients are Europe, US and Australian based. Arcanys is also launching its own accelerator in Switzerland in the first half of 2016. Be self-motivated and passionate about new technologies. Have an ability to work together with an international team. Have excellent English communication skills. Flexible working schedule. You can come in as early as7am to as late as 11am. Developers and all technical team members are enrolled to our medical insurance on first day of employment. Also, a maximum of 3 dependents can be enrolled after your 3rd month of employment! DOTA player? You can play this to your heart’s content, in our office no less. We are a great example of a fun working environment! 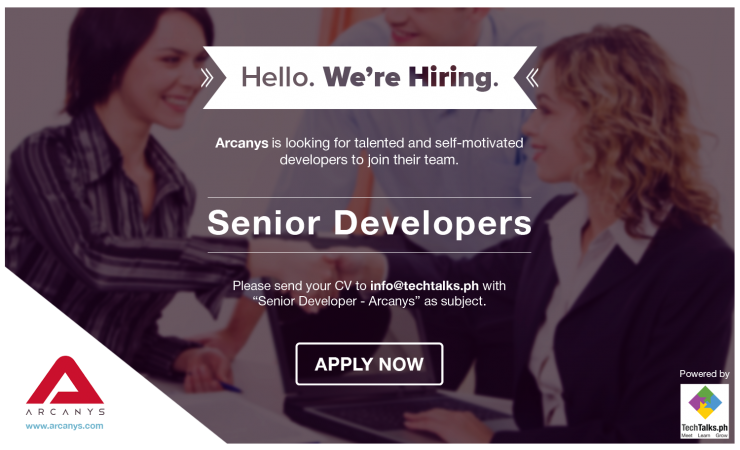 Please submit your Curriculum Vitae (CV) to info@techtalks.ph with "Senior Developer - Arcanys" as the subject.